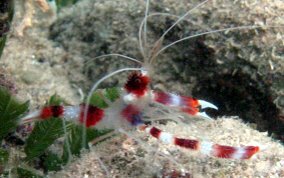 Also known as the Barber Pole Shrimp, or Candycane Shrimp, but is actually not a true shrimp. 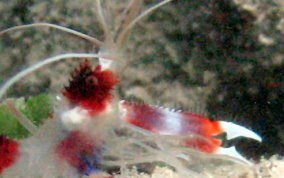 These are cleaner shrimp and are quite common. They also scavengers. Look just under overhangs and in recesses. The two pairs of thin white antennae will be the first indication of their presence. They will usually be upside-down on the ceilings. It is their middle legs that grow the big claws, not the first pair as crabs do. 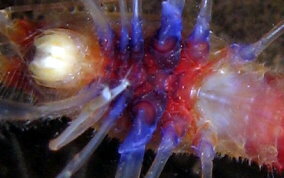 Much of their bodies are translucent. The are found in shallow water and range in body size is about 3 inches with antennae and claw legs about twice as long. When you see two together they are usually a mated pair. If they loose an leg or a claw, they have the unusual characteristic of being able to regenerate one when they molt. 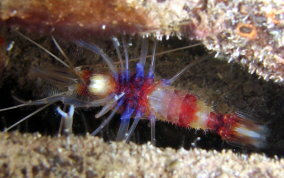 It's open-arm erect stance also gets it the name Banded Boxer shrimp.